These option parts are strengthened versions of the A parts from Item 56301 King Hauler. The molded polycarbonate is reinforced with carbon fibers to increase toughness, while the matte finish improves the models realistic look. Compatible with any Tamiya 1/14 scale tractor truck models. These option parts are strengthened versions of the B parts from Item 53602. The carbon reinforced molded polycarbonate parts offer increased strength. They are particularly useful for frequent towing. You can expect better axle shape retention and gear durability when using this reinforced part. Compatible with Items 56302, 56306 & 56333. If using with Item 56310, only parts B1, B6, B13 & B14 are compatible. Not compatible with Tractor Trucks or Carson Trailers. This sticker set allows you to customize the look of you semi-tractor and semi-trailer truck. Stickers depict markings, which are seen on European trucks. Contains a range of stickers to depict national identification marks, warning markings, speed limitations, individual letters/numbers, and much more! A large number of different designs mean that you will be able to create an individual scheme. Usable with any 1:14 scale tractor truck body. This joint cup set features newly-designed parts to replace the kit-standard parts. They are made from a heat-treated alloy which features greater resistance to wear and tear. They are attached by pin and axle ring, which leads to smoother rotation and less tendency for the joint to come apart. 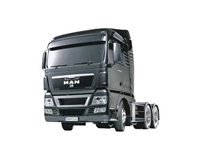 Compatible with 4x2 R/C tractor truck models. Aluminum parts give a more authentic weighty feel when compared to kit-standard plastic parts. This coupler lever plate is a part used in the coupler unit of R/C tractor truck models, which enables the use of separately available support legs. The aluminum part gives Tamiya's RC semi-trucks a more realistic look. 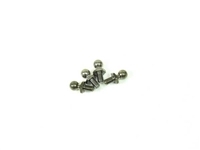 Screws and other small parts necessary for attachment are included. Compatible with 1/14 scale R/C tractor trucks. Note this part can also be attached when separately available support legs are not being used. Compatible with 6x4 R/C tractor truck models.